Brian Proffitt looks for the next $1 billion open source company. This year Red Hat recently surpassed US$1 billion annual revenues (and also $10 billion market capitalization). One can debate what counts as an “open source company” (presumably something like “[almost] all software developed and distributed is open source”), but Red Hat is relatively uncontroversial; less so than the companies Proffitt lists as possibly next: EnterpriseDB, , and Eucalyptus. I might have included Canonical Ltd among those, but I didn’t look closely for indicators of whether any could reasonably become $1 billion annual revenue companies, or reach an easier $billion milestone, valuation — Proffitt notes that MySQL AB was acquired for approximately $1 billion in 2008. An even more obvious addition to the watchlist ought be Mozilla, which should have annual revenues exceeding $300 million. Mozilla is least problematic on the “open source” front, though the for-profit corporation is wholly owned by the non-profit Mozilla Foundation, which could lead one to overlook it as a “company”. This also means it won’t have a traditional company valuation (acquisition price or market capitalization), but it’d be clearly over $1 billion. There’s one other open source organization that, if it pursued huge revenues and were for-profit (both requiring many counterfactuals that may well have destroyed the project; I advocate neither, though I have advocated huge revenues in the past) would be a billion dollar company by valuation and perhaps revenue as well — Wikimedia. I wonder, given that it forgoes huge revenue from advertising, and most people claim to dislike and find little or no utility in online advertising, what we can conclude about the consumer surplus generated by Wikimedia? As hugely problematic as they are, huge organizations (most obviously governments and corporations) outcompete smaller arrangements in many aspects of human society. If software freedom and the like is important, advocates ought to be rooting for (and criticizing) huge “open source” institutions. And should also be looking for (admittedly difficult) characterizations of consumer surplus and other “billion dollar” metrics in addition to firm revenue and valuation of future profits. I’m very mildly annoyed with some discussion of “open data”, in part where it is an amorphous thing for which expectations must be managed, value found and sustainable business models, perhaps marketplaces, invented, all with an abstract and tangential relationship to software, or “IT”. “Open” and “data” should sometimes be considered separately. “Open” (as in anyone can use for any purpose, as opposed to facing possible legal threat from copyright, database, patent and other “owners”, even their own governments, and their enforcement apparatuses) is only an expensive policy choice if pursued at too low a level, where rational ignorance and a desire to maintain every form of control and conceivable revenue stream rule. Regardless of “open” policy, or lack thereof, any particular dataset might be worthwhile, or not. But this is the most minor of my annoyances. It is even counterproductive to consider, most of the time — due to the expense of overcoming rational ignorance about “open” policy, and of evaluating any particular dataset, it probably makes a lot of sense to bundle “open data” and agitate for as much data to be made available under as good of practices as possible, and manage expectations when necessary. To minimize the need to make expensive evaluations and compromises, open data needs to be cheap, preferably a side-effect of business as usual. Cheapness requires automation requires software requires open source software, otherwise “open data” institutions are themselves not transparent, are hostage to “enterprise software” companies, and are severely constrained in their ability to help each other, and to be helped by their publics. I don’t think an agitation approach is optimal (I recently attended an OpenOakland meeting, and one of the leaders said something like “we don’t hate proprietary software, but we do love open source”, which seems reasonable) but I am annoyed nevertheless by the lack of priority and acknowledgement given to software by “open data” (and even moreso, open access/content/education/etc) folk in general, strategic discussions (but, in action the Open Knowledge Foundation is better, having hatched valuable open source projects needed for open data). Computation rules all! A “data marketplace” should not be the first suggestion, or even metaphor, for how to realize value from open data — especially not in the offices of the Wikimedia Foundation. Instead, mass collaboration. Open data is neither necessary nor sufficient for better governance. Human institutions (inclusive of “public”, “private”, or any other categorization you like) have been well governed and atrociously governed throughout recorded history. Open data is just another mechanism that in some cases might make a bit of a difference. Another tool. But speaking of managing expectations, one should expect and demand good governance, or at least less atrocity, from our institutions, completely independent of open data! “Nuance” is a vague joke in lieu of a useful title. I recognize the rhetorical value of pointing out that copyright can be used for unambiguous censorship but I try to avoid doing so myself: “can be used for” downplays “is”. But the following is too good to let pass. Paprocki made a video sermon in which he says that voting Democrat puts one’s soul at risk, while disclaiming telling anyone how to vote. 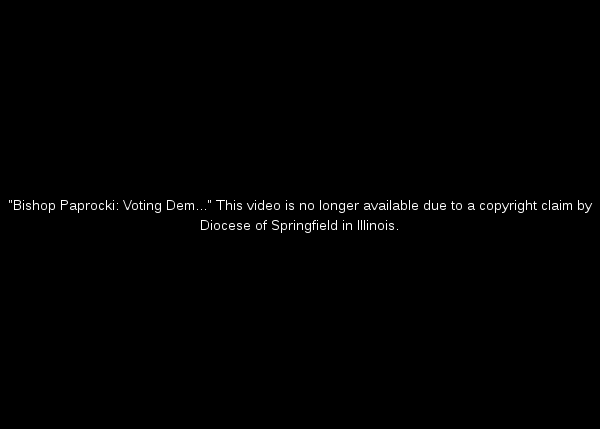 Bishop Paprocki: Voting Dem…This video is no longer available due to a copyright claim by Diocese of Springfield in Illinois. I’m going to guess that Tashman’s use of the Paprocki video sermon was very clearly fair use. But even if the entire video was included verbatim, it’d be a zero diff parody. If you want to watch that, the original is linked above, and excerpted and uncut-with-but-grainy-with-additional-watermark versions posted by Paprocki fans remain on YouTube. I don’t see how Paprocki’s statements could be electioneering, as nobody believes in eternal salvation or damnation, right? In case I’m wrong, some are using the opportunity to call for revoking the Diocese of Springfield’s tax extempt status.